Boosted aloft atop a Saturn IB rocket, and utilizing a special “milk stool” to raise its umbilical connections to the proper levels on the Pad 39B gantry, the third and final Skylab crew takes flight on 16 November 1973 (Credits: NASA). Forty years ago, on 14 May 1973, the United States launched its first space station, Skylab, into orbit. The mission appeared to go badly from the outset, with aerodynamic forces during ascent ripping away a protective micrometeoroid shield and one electricity-generating solar array and leaving the second array clogged with debris. Eleven days later, after an enormous amount of preparation and replanning on the ground, the first crew was launched and triumphantly brought the station back to life. Returning to Earth after 28 days, they were followed by the science-heavy 59-day flight of the second crew in July-September, leaving only the third crew of Commander Gerry Carr, Science Pilot Ed Gibson, and Pilot Bill Pogue to begin a world-record-breaking 84-day mission in mid-November. Forty years ago this week, the flight of Carr, Gibson, and Pogue got underway … and despite its spectacular scientific success it will be forever remembered (somewhat unfairly) in the popular imagination for two things: a sick bag and the first “mutiny” in space. Even before launch, the third crew lived in the shadow of the second crew, who had exceeded their mission goals and achieved a 150-percent science return. By the end of October 1973, NASA announced that Carr and his men would fly for at least 60 days, and perhaps as long as 84 days. One of the main worries was that the three men would fall victim to “space sickness”—properly termed “Space Adaptation Syndrome”—but with a U.S. Air Force Thunderbirds veteran like Bill Pogue as a member of the crew, surely the chances of him being one of the sufferers were infinitesimally small. For if anyone’s stomach could be turned upside down and inside out with multiple rolls and other churning maneuvers, with scarcely any ill-effects, Pogue was the man. It did not quite turn out that way. The fortunes and misfortunes of Carr and Pogue in Project Apollo have been discussed many times. In the spring of 1970, both men were placed on what Pogue described in his NASA oral history as “a phantom backup crew” for Apollo 16, alongside veteran astronaut Fred Haise, with an anticipated (though not formally announced) future assignment to the Apollo 19 lunar landing mission. 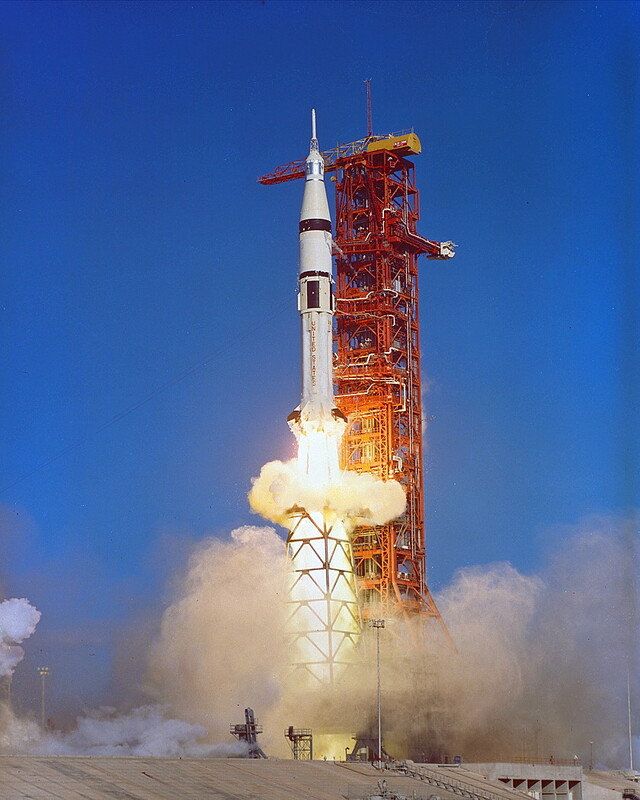 However, amid steadily tightening budget cuts, the final Apollo flights were canceled by NASA on 2 September 1970, and early the following year Carr and Pogue were teamed with scientist-astronaut Ed Gibson to fly the final Skylab mission. Since Pogue had trained as a command module pilot, it made sense for him to serve as pilot on the Skylab crew, for many of his former duties would translate from one role to the other. Carr, on the other hand, had originally trained as a lunar module pilot, and in Deke Slayton’s mind it made sense to offer him the commander’s seat. It made Carr only the fourth American to command a crew on his first flight in NASA’s history. Slayton had another reason to give Carr this command. Personal recommendation went a long way, and Carr’s sterling work for Charles “Pete” Conrad on the Apollo 12 support crew had earned him deserved brownie points. Conrad was now “Sky King,” head of the Skylab branch of the astronaut corps, and had a big say in who should fly each mission. With all these factors in mind, it is not surprising that Carr received his command. 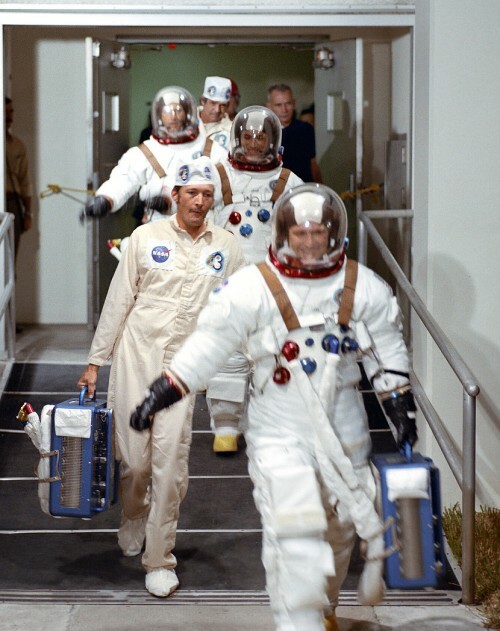 Gerry Carr leads his crew out of the astronaut quarters at the Kennedy Space Center in the hours before launch (Credits: NASA). Unfortunately, more experiments were then added, “and we allowed ourselves to get trapped into this new situation.” Carr would find that he and his crew had over-committed themselves and, in orbit, after a few days, would be in real trouble. In late October, NASA announced 10 November as the target launch date, with the first of up to five EVAs scheduled for a just week later to install the first set of film into the station’s Apollo Telescope Mount (ATM). Repairs of an antenna on the S-193 experiment would occupy a second excursion, whilst a third—planned for Christmas Day 1973—would include photography of Comet Kohoutek. A fourth EVA on 29 December would perform additional experiments and retrieve material samples from Skylab’s hull, and a final outing in mid to late January would collect the final sets of ATM film for return to Earth. Although NASA hoped to extend the duration of Carr, Gibson, and Pogue’s mission to 84 days, the agency cautioned that any extensions would be decided and implemented on a weekly basis. 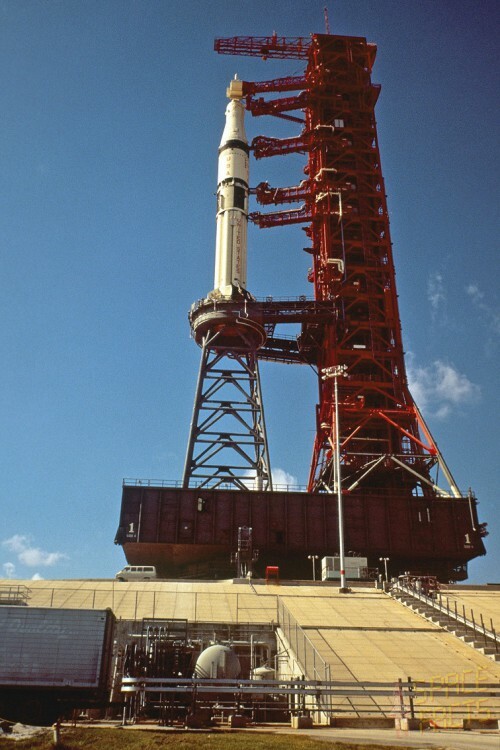 In the meantime, the Apollo spacecraft and its Saturn IB rocket continued to be readied for flight. Standard pressurization and other checks in October had gone well, until, on 6 November, a management meeting at Cape Kennedy was interrupted by news that inspectors carrying out routine structural integrity checks had found hairline cracks in the aft attachments of the eight stabilizing fins at the base of the first stage. More than a dozen cracks were found in total. Most likely, the cause was related to age—the rocket stage itself had been delivered to the Cape more than seven years earlier and kept in storage for much of that time—but three months sitting on the launch pad, in the salty air of the Cape, was also a contributory factor. With the possibility that the compromised fins might be ripped away during ascent, NASA delayed the launch so that replacements could be installed. This was no easy task. Simply rigging the support platforms on the Pad 39B “milk stool” to remove the first fin took 35 hours. Nevertheless, by the early hours of 13 November the work was completed and launch rescheduled for the 16th. Carr was particularly upset by the delay, since their original date on 10 November happened to be the official birthday of his parent service, the U.S. Marine Corps, founded in 1775. With the exception of John Glenn, who flew into orbit alone, Carr would become the first Marine ever to command a space crew. In order to commemorate both this anniversary and this milestone, the Commandant of the Marine Corps himself, General Robert Cushman, and several of his key staff were to visit the Cape and watch the launch. Pad 39B was originally designed for the large Saturn V, and the smaller Saturn IB for the Skylab missions required a “milk stool” to elevate it to the proper level to access the gantry’s utilities and umbilicals (Credits: NASA). The launch itself was picture-perfect and all three men would relate lucidly their memories of riding the Saturn IB. As propellants flooded into the combustion chambers of the eight H-1 engines, Bill Pogue likened the sound to someone having simultaneously flushed every toilet in the Astrodome. Seconds later, the behemoth left Earth, convincing Ed Gibson that the basement had just exploded. Pogue thought he stayed pretty cool and calm throughout the experience, but a later conversation with flight surgeon Fred Kelly assured him that his pulse had accelerated from 50 to 120 at liftoff. The vibrations in the command module’s cabin were intense throughout the climb; one of Pogue’s responsibilities was to follow the launch profile in his procedures book, and he quickly found that his hands (and the book) were shaking so much that he could hardly read it. The noise was so intense that they could hardly hear each other’s voices over the intercom between their suits. Carr and Gibson agreed with Pogue that the first part of the ascent, in the lower atmosphere, was by far the most dynamic. “You get an awful lot of turbulence and a lot of shaking,” Gibson said. “I would equate it to being a fly glued to a paint shaker! There’s something massive there that you’re sitting in that’s really giving an extreme turbulence.” For his part, Carr likened the first part of the journey uphill to riding a train with square wheels. At the point of staging, when the first stage burned out and the single J-2 engine of the S-IVB second stage took over, the transition from four times their normal weight to around 1.5 G was acutely noticeable. Thereafter, flying the S-IVB for the remainder of the trip into orbit was a dream, and when its engine finally shut down, some 8.5 minutes after liftoff, all three men were astonished to observe that their supposedly “clean” craft was now filled with debris: dust, particles, paperclips, screws, and washers. Their arrival in space was greeted with bewilderment. Looking “down” on Earth, Carr’s months spent studying terrestrial features and landmarks counted for nothing; he could see nothing that he recognised. Then, after about half an hour or so, he spotted the heel of Italy and it was this image which would remain with him, indelibly printed on his memory. “I’ve never forgotten that particular experience,” he said. For Gibson, the gradually receding coast of Florida was his first view of the glorious Home Planet. For Pogue, on the other hand, the euphemism known as “stomach awareness” would very soon take center stage. Image caption: Skylab and its Apollo Telescope Mount (ATM) was a critical asset in observing Comet Kohoutek in the winter of 1973-74 (Credits: NASA).